I made a fun card without a sentiment so it could be used for any occasion or I could put one on later. 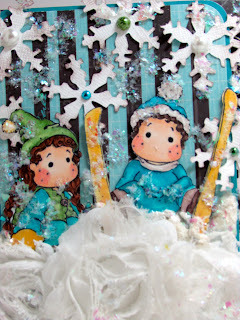 I used Twig paper from Yellow Bicycle along with Magnolia's Tilda on the Roof and Ski Edwin with snowflakes, only I cut the snowflakes off Edwin. The puffs on the bottom are 3 ribbon roses from my friend Sandy, she is very generous. I thought that they would make great giant snowballs for my 'crash and burn' theme. Here are poor Edwin and Tilda stuck in a pile of snow and flurries flying all over them. To create the crash effect I used Tim Holtz snowflake dies and border and then sprinkled Stampendous shaved ice everywhere. I like the Twig paper design which sets the scene among trees and makes it wintery. This is side view showing part of the inside of my card and some dimension. Thank you for stopping by today, I appreciate your taking time out for me! Just lovely!! It's snowing like crazy here in NY state today! Great card Kelly and I love those roses! They would be great as just roses but they remind me of snowbanks and I think that's pretty clever the way you used them. Cute Magnolias too! Gorgeous card, Kelly. 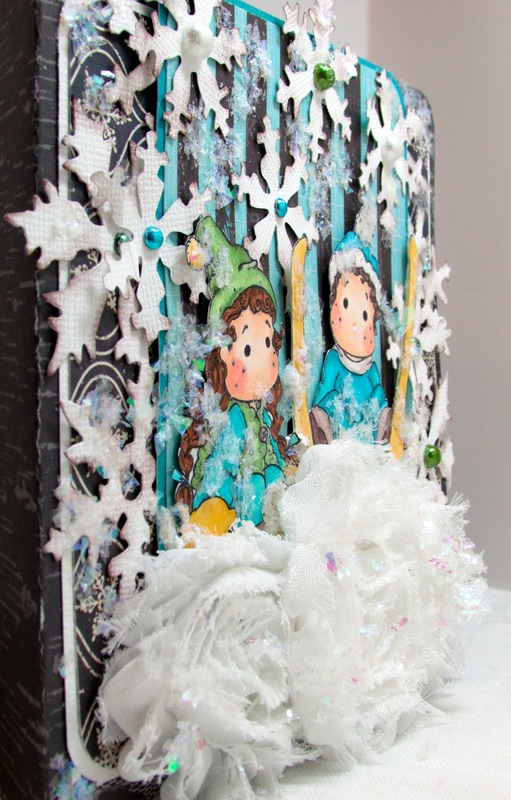 Love the snowy scene and fabulous color combo. 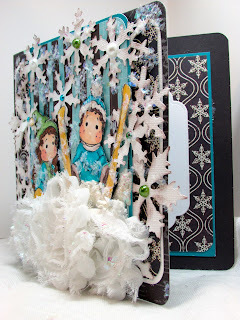 Awesome shabby chic ribbon flowers that create a snow bank effect, very creative. Such a fabulous card, and great snowey scene. 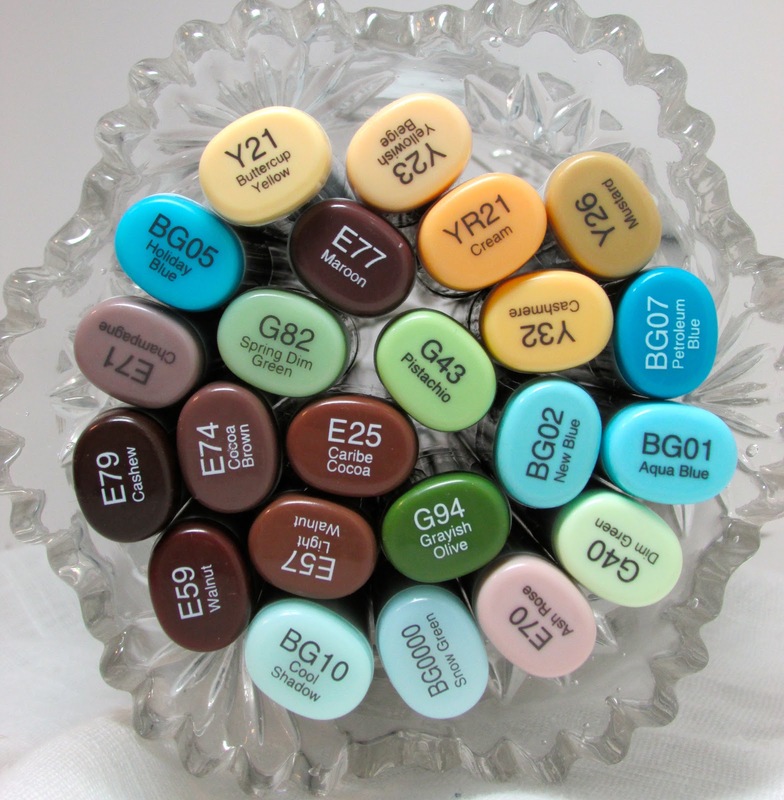 Thank you for joining in the Crafty Sentiments challenge this time. Gorgeous card Kelly. So snowy with all the snowflakes. Love it. Thanks for joining us at Tilda's Town Challenges this week and good luck. Hugs Carla. This is beautiful Kelly. Great colours and the snow effect is fab. Love the image. Kelly, this is adorable!! Your coloring is amazing. I love the colors, the snow effects (I never see snow rs...rs... but it looks great on pics) the big white flowers are also divine!! Wow Kelly, this is an incredible "scenic" card! I love this and you did a great job with the "snow" and the lovely flowers! Fantastic winter scene and great coloring. Thanks for joining us at Crafty Sentiments. Hello Kelly, wonderful card. Love the scene you have created especially the background. Also the snowballs are stunning. You did a fantastic job as always with your card and coloring. Beautiful kelly, and very apt for the weather we are having in the UK. This is Snow Fabulous! Wow Kelly you really used your imagination to create such a fun scene. Great colors and texture. It sort of looks like the snow outside my window. Another great creation! Wow! Kelly, well my dear friend, what can I say that hasn't been said already. I love you card, but then again I love all your creations. The papers are fabulous as are these sweet images. Beautiful work my dear. 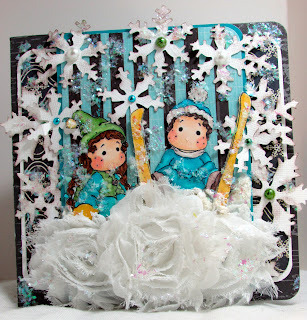 Fabulous card, love those huge flowers, perfect snowballs, thanks for joining us at Crafty Sentiments this week. Exquisite card Kelly, I love the flowers usedas snow, such a clever idea! gives fluffiness! awesome coloring of Tilda and Edwin. wonderful scene too! Hugs. Gorgeous!!!! Such a fantastic scene! I think Sweet Stamping Pixies is snowflakes or something winter too! 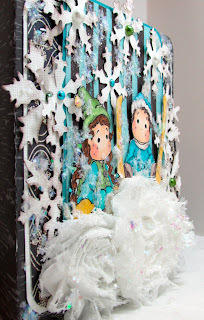 Fabulous card Kelly, love the images and all the snowflakes. Very pretty winter scene with a big bunch of snow(flowers). Thanks for joining us @ Tilda's Town challenge this week! Hi Kelly, your card is so adorable! 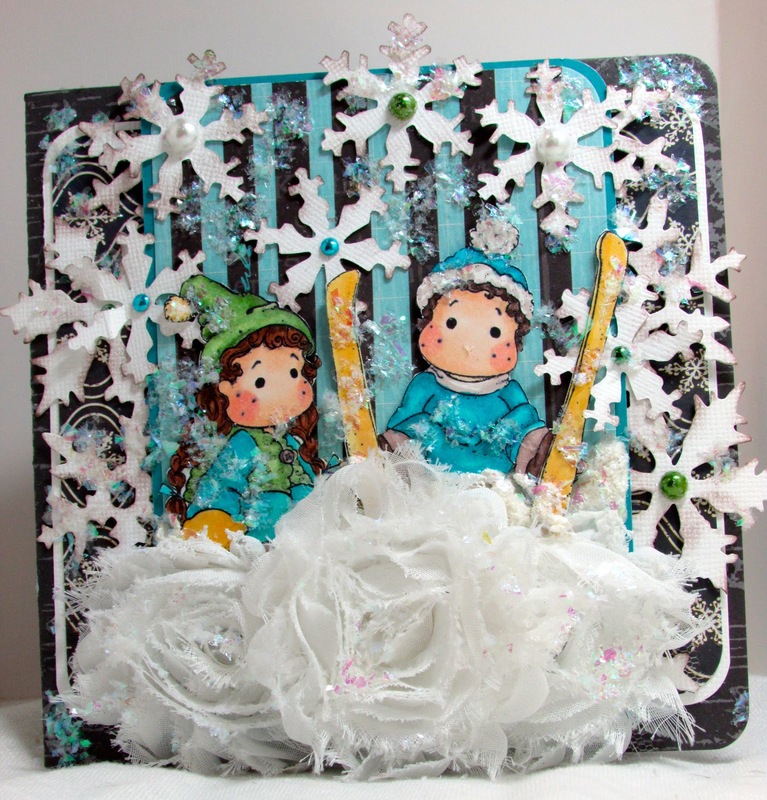 I love how you used the white flowers as snow for the beautifully colored Tilda and Edwin! Wow! I just loved it! The fluffy ribbon, the cute Tilda and Edwin, all beautiful. Thanks for playing along at Stamp and Create with Magnolia. Oh, this is so pretty! Love the colors and your design is fabulous! hugs, Frances. Your card is stunning! I love the flowers you incorporated in your design. Great colors too. I love your scene card Kelly, wintery and gorgeous with the tree background, all the snowflakes, sparkle and the gorgeous snowbank of ribbon roses.....you are so clever to think of that and Sandy is the best with the most generous heart I agree! Your colouring is beautiful as are all the lovely details of your design. You are so expert at putting the Magnolia's together and the scenes that you put them in, I love that too! OH MY GOSH I LOVE THE SNOWBALLS!! Nice chilly scene you have going on here. Brrrr...ok I have to get my blanket cuz really....that made me chilly! Great card! Hugs! Fantastic card love the snow flakes. It does look burrrr cold. Great colors. WOW! What a beautiful snowy scene! Thanks for joining us at Tilda's Town this week. Very creative design work, Kelly....love Tilda and Edwin stuck in the snow! Superb coloring, as always! Sorry hun I had to delete my first comment as the cat jumped on the laptop as I was tying and very kindly published half way through a word lol. Very cute card, love all the dimension that you have added. Thanks for playing at Stamp and Create with Magnolia. What a gorgeous card!! I love your wonderful coloring and all of those fabulous embellishments. Thank you for playing along with the Stamp and Create with Magnolia Challenge! We have another fun one today: Spring Flowers (Spring Magnolia image with some flowers on your project). We hope you will play along again soon.